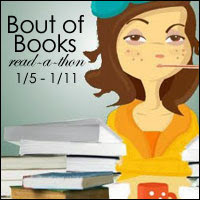 It's two hours until the end of the first day of Bout of Books 12, and I have very little reading to show for it. Oops. I'm planning on devoting the last hour or so of my evening to really digging in to The Glass Magician, the second in the Paper Magician trilogy by Charlie N. Holmberg. The series is a stark departure from what I usually read, but I'm flying through it. I guess my brain needed a break from all the heavy things I tend to feed it. Before I escape into my book, I wanted to throw my hat in the ring of today's Book Scavenger Hunt, hosted by the lovely Stefani of Caught Read Handed. Check out my artsy goofy photo! 1. Find an author with the same initials as you. Failed. I blame the world not having enough S.C. writers. 2. Find a book with the color yellow on it. Passed! Hyperbole and a Half, by Allie Brosh. I've only read half of this one, but it's adorable and fantastic. 3. Find an author's name with the letter "S" in it. Passed! Passage, by Connie Willis. 4. Find a book with a female protagonist. Passed! The Paper Magician, by Charlie N. Holmberg. Oh, Ceony, you silly yet strong little lady. I can't help but love you. 5. Find the longest book you own. Passed! Les Misérables, by Victor Hugo. What a brick. 6. Find a book with a map in it or on it. Passed! The Gods of Gotham, by Lyndsay Faye. This one has an old-timey map of New York City in it. 7. Find a book with a face on it (photograph or illustrated). Passed! The Complete Works, by Michel de Montaigne. Check out that skeptical, mustachioed mug. Bonus: Find something on your shelf that isn't a book. Passed! This is a wicked complicated Moravian star a very old friend made for me. Many of the points are beat up after moving... at least five times? Possibly more, but it's too pretty and meaningful for me to toss. Ooh, good choice! I was assuming we had to stick with books we already had, so I didn't even think of that one. I've actually never read Perks - can you believe that? Extra points for precarious alignment of books. Les Mis has always looked terrifying to me. How many pages is that?? And oh my, I'd have to check my copy when I get home, but Goodreads says it's in the neighborhood of 1400 pages. I will conquer it one day! Thanks for the Twitter add! I agree that the character limit can be frustrating, but it's been so much fun for BoB and just another way to get my blog out there! And yup, that's exactly what I got mine for, too! I was debating whether I wanted more of a functional tablet, but then I realized that all I really wanted was a great device to read on, and the Kindle Voyage is just that. 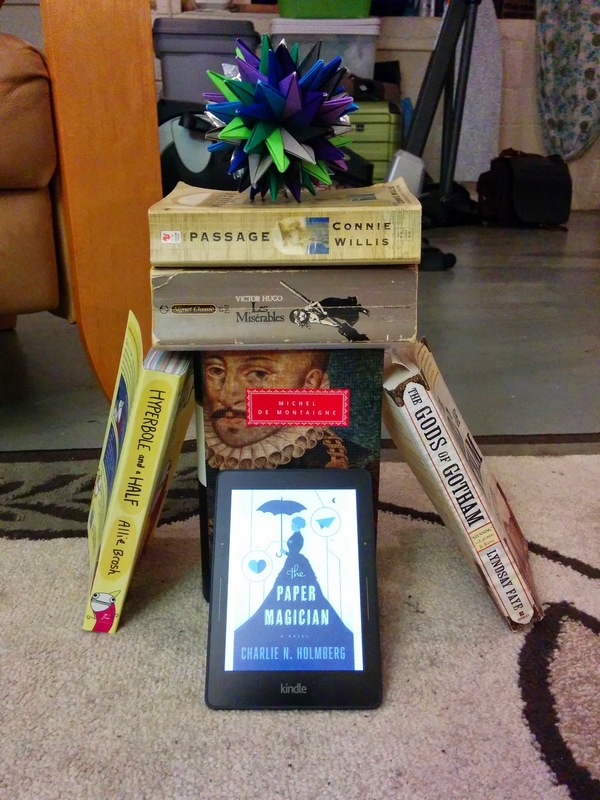 And agreed on the Kindle's portability!